Communing with nature typically brings about a sense of tranquility. 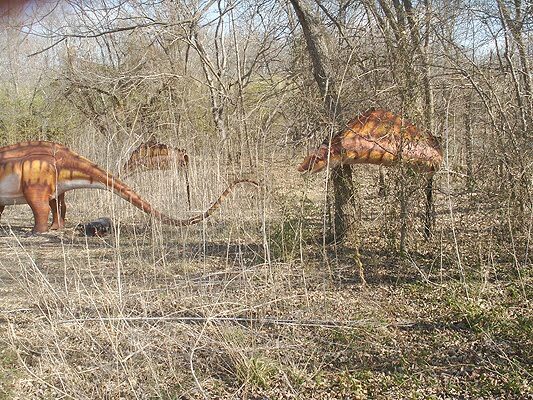 A spring breeze, the crackling of autumn leaves, the roaring of a hungry robot Therizinosaurus, they can all lead to a heightened sense of centeredness. This zen-like level of awareness is capable just by taking a simple trip down Hoot Owl Trail. 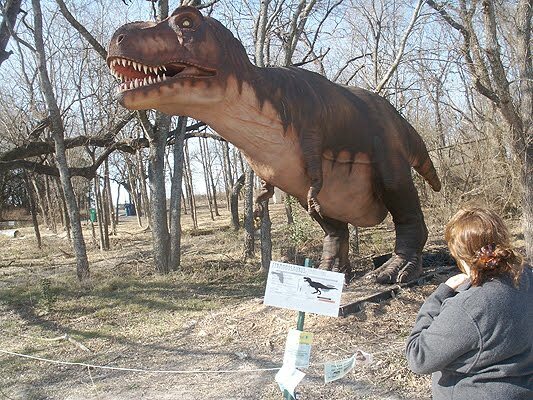 The Heard Natural Science Museum & Wildlife Sanctuary is known for its work in environmental restoration, raptor rehabilitation (bird-raptors, not necessarily dinosaur-raptors) and acres of hiking trails. Most notably for me, however, is that it is the latest stop of the "Dinosaurs Live!" traveling exhibit. Now, think of the greatest museum exhibit you've ever seen. 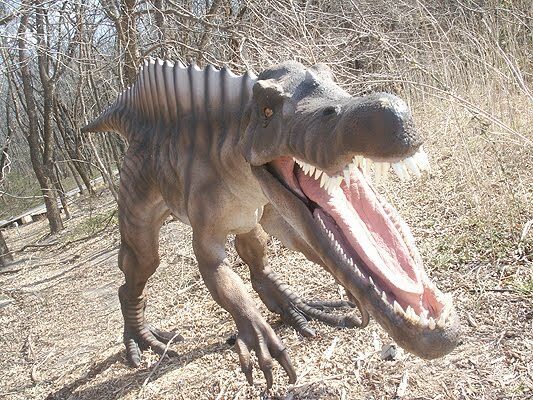 I'm sure that as you were enjoying that exhibit you were thinking, "The only thing that would make this better would be a robotic component and some type of dinosaur." Well I absolutely agree. There's an old Celtic saying, "No matter what it is, robot dinosaurs make it better." So let's hit the trail! The "Dinosaurs Alive!" touring exhibit travels the country to bring "dino-robotly" goodness to the masses. 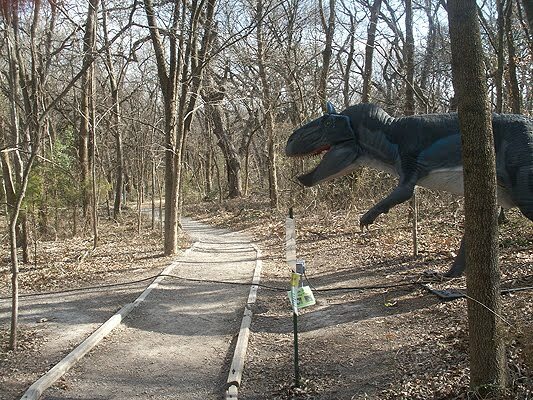 Its latest stop at the Heard includes a dozen roaring, robotic thunder lizards strewn across the Hoot Owl & Sycamore hiking trails. They move. They growl. They even spit. As much as I love robot dinosaurs even I wasn't oblivious to noticing a flaw or two. 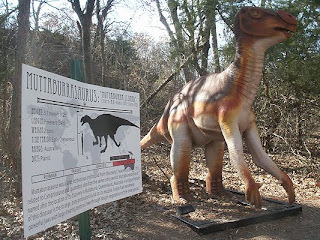 For example, it seems the Amargasaurus was meant for a brushier, greener local. 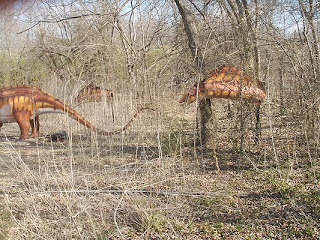 Ideally the alpha Amargasaurus stands in front as the others poke their heads through the bushes. However, the month of January is not terribly conducive to this type of presentation. So what we end up with is "Amarga Prime" surrounding by the mysterious, severed floating heads of his friends. It took a good fifteen minutes of staring to figure out exactly what was happening. Unforgivable? Certainly not. The best laid plans are always at the mercy of the weather. 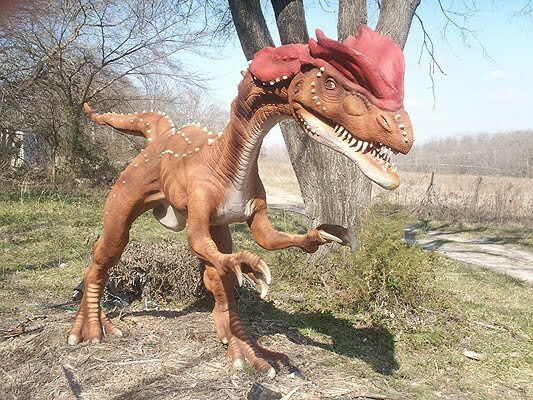 And I've never heard of anyone complaining about too many robot dinosaur heads. Surely there were bigger and more ferocious dinosaurs, but none of them had as good of a press agent of the T-Rex. As such, he is the anchor and grand finale of the trail. Kids ran in fear, gasped in awe and crapped pants out of panic. Tears were shed, rocks were thrown and everyone walked away a little more educated. 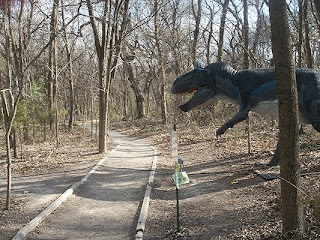 All in all, we come away from the exhibit with the understanding that even though man and robot dinosaurs are natural enemies, we can all hike the same nature trails.